A small crochet hook, two of any kind of largish bead (I used a cute owl) plus two smaller beads to use as anchors for the larger ones. A small quantity of yarn, I think about a meter (just over a yard) is probably enough. You will also need a couple of hook style earrings, you can either buy some or raid some from an old pair of earrings that you never wear these days..
And a pair of pliers is handy for opening and closing the ring attachments for the earrings. Thats pretty much it! You can always add any other embellishments you have floating around, feathers, seed beads, shell.. anything can be glued or stitched or suspended. Ok so here is the crochet part and where I may get a little vague, but bear with me and ask questions in the comments if anything is unclear or fuzzy! Chain three, then double crochet into the circle. By double crochet I mean: yarn over, through the circle and pick up the yarn, then pull through one then pull through two, then pull through the last two. Next chain one, then double crochet into the circle again, keep doing this to make your round shape until its a nice circle and sits flat when you join the last double crochet to the first one with a slip stitch. 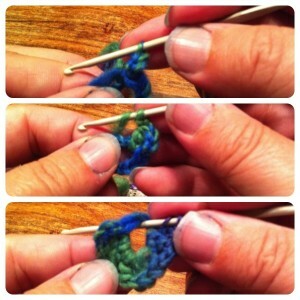 You dont want it to curl up, that would mean you need to do some more double crochets into the middle. Next we are going to attach the bead. Take the end of the yarn (leaving your crochet hook in the last stitch) and use a tiny hook, or a needle to thread the bead onto the yarn. If its like mine and has a top and bottom, make sure the head is closest to your work. Yes.. I had to re-thread mine when I discovered it was upside down. Twice. 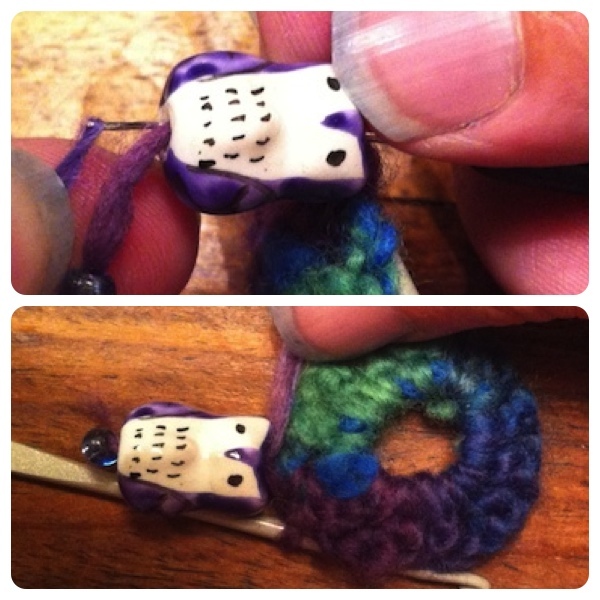 Pull it up to the top of the yarn so its against the last stitch, then thread your ‘holding’ bead on. You need to then bring the yarn up around the holding bead and thread it back through the big bead. You should now have the yarn back between the top of the bead and the crochet, so make a single slip stitch and pull it through your last stitch all the way to make a knot. If you want it really secure you could make an extra chain stitch there too. And thats it! 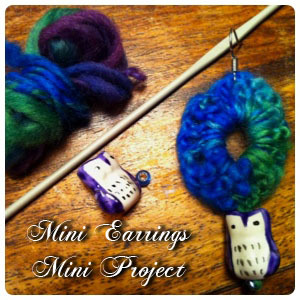 Weave the end of your yarn through a little way round the back of the earring to keep it in place and snip off the excess. 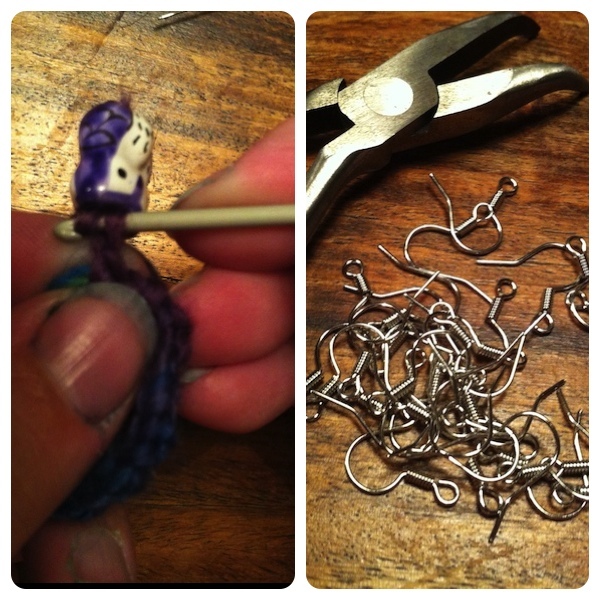 Then you need to attach the earring hook, simply open up the ring with your pliers, and hook the yarn at the top of the earring into the ring, close it up firmly with the pliers, your earring should have nicely from there. Now youre done! Oh, except, you probably need two of these 🙂 So go back and do it again! I hope that all made sense! Just ask if it didnt. 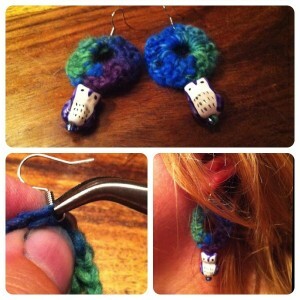 This is a really simple idea and I used beads, but I am thinking next time of using some pretty paua shells to hang underneath, you could also add beads around the circle as you crochet, using the technique I described in my hoop earrings Newsletter for crocheting the beads into place, I think that would look really cute! If you make any of these please come and share them on my Facebook page, I would really love to see your own variations on this! It’s soooo cute! 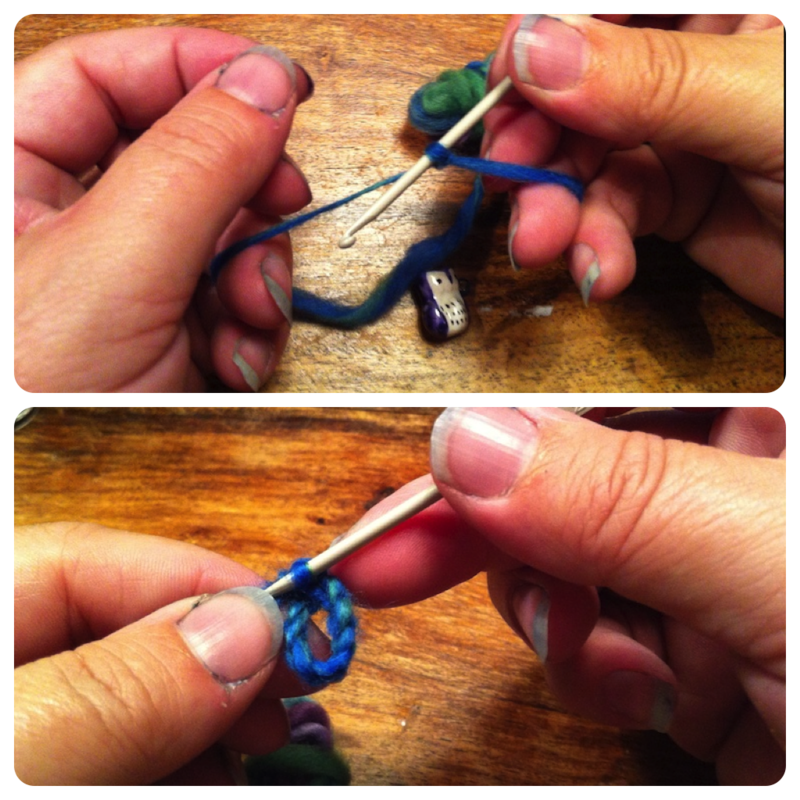 Do you use a really tiny crochet hooks for threading the beads on? Is that also the hook you used in the video for the hoop earrings?